The Caribbean will get a sample of the extraordinary talent of locals when a mini-feature on the 2007 St. Kitts Music Festival airs on Hype TV. This was revealed on Tuesday?s edition of SKNIS Perspectives by Corporate Communications Manager of the St. Kitts Tourism Authority Ms. Unoma Allen who said that this part of the creative promotional package would unveil the talent of nationals of St. Kitts and Nevis. ?We also embarked on promotions on Hype TV and created a mini-feature where they interviewed local Music Festival performers such as Royalties, Queen Anastasia, King Konris, Jazzique Chiverton and so on,? she explained. ?The package will be appearing shortly. 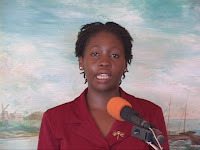 It is very important that people understand the talent that St. Kitts and Nevis possesses,? Ms. Allen stressed, adding that many fans will be shocked. Ms. Allen who is also a member of the St. Kitts Music Festival Marketing Subcommittee explained that the role of her subcommittee is to promote the summer festival. She said one of its targets is the press who are interested in coming to St. Kitts to cover the Music Festival. The Marketing Subcommittee, Ms. Allen said, has the responsibility of selecting media houses who would reach target visitor markets. She revealed that promotions are going well and media have pledged to promote the Festival prior to its staging as well as by means of visiting the Federation to cover the event. The Marketing Subcommittee member revealed that Sweet 100FM of Trinidad and Tobago and PJ82 of St. Maarten were among radio stations in the region who were offering their listeners ?give-aways? which included a trip for two to the St. Kitts Music Festival. She again stressed the importance of the media. ?So individuals from various media houses understand the power of the Music Festival and they want to come to be a part of it,? she revealed. ?What we look for is the hunger of the media representative. We don?t want them to just come here, cover the festival then return. We are looking for those who go beyond the Music Festival and want to interview the Minister of Tourism and the Prime Minister and want to know how life is on St. Kitts and how it?s developing.? The artiste line-up was described as being one of the top draws to this year?s Music Festival. Fans have been excited by the Festival selection which includes Michael Bolton, Ne-Yo, Allison Hinds, Sean Paul, Machel Montana, Big Boi and Maxi Priest. Ms. Allen also noted that the ?affordable? ticket cost of US $40.00 or EC $100.00 was another attraction. Another means of promotion is being undertaken by major sponsor Cable and Wireless which launched a Text-to-Win Competition for the Caribbean that would enable 17 persons outside of the Federation to win Music Festival prizes. Another promotional strategy undertaken by the Marketing Subcommittee is to encourage more Nevisians to attend the Festival. She said one of the drawing points would be the fact that fan-favourite, local composer and musician Jazzique Chiverton who lives and works in Nevis would be in this year?s line-up. The full interview with Ms. Allen is available on demand by clicking the June 12 edition of Perspectives via the Audio/Visual link.